Want to enjoy the thrill of the machine and a sense of discovery as you venture on an ATV through Jaco's groovy surf side town and gorgeous jungle that surrounds the 2.5 mile-long Jaco beach? Hidden waterfalls, local villages, incredible views and super off-road terrain will challenge even the most experienced ATV enthusiasts. Explore the best off-road action this region has to offer on one of our Jaco ATV, Buggy or Motorcycle tours. 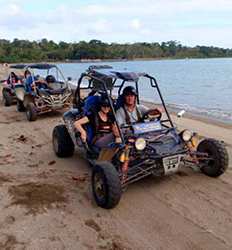 We have the perfect Jaco ATV, buggy, or motorbike tour to fit your vacation plans. From our Express 2-hour off-road excursions to a full day of mud-slinging ATV fun, The Real Deal Tours has you covered in terms of action packed off-road fun! Our bilingual guides cover all safety instructions before you hit the trail, and our equipment is top of the line for riders of all ability levels. 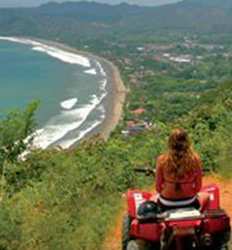 Enjoy the freedom and fresh air in one of Costa Rica's most well-known surf destinations and party hot spots on one of our super cool ATV tours in Jaco. 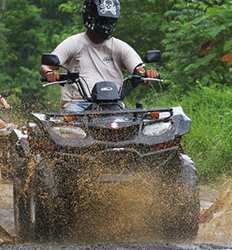 Below we have compiled a list of ATV & Off-Road tours available to you in the Jaco Beach region. 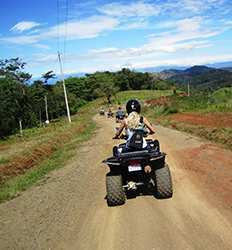 Exploring Costa Rica off road by ATV is one of the many activities in Jaco not to be missed! Our Express Jaco ATV Tour is the quick blast of fun you've been craving! The Jaco ATV Tour Express is perfect for those who are short on time but want to explore Costa Rica's rainforest off the beaten path. Hurry up! Book your discount ATV tour today. 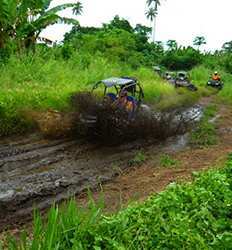 Jaco ATV Tour Express deposit is $10.00 per One Person ATV and $10.00 per Two People ATV. Want to take in the best of Costa Rica but looking for a little adrenaline rush? Are you ready for 4 hours of quaint towns, friendly smiles, unreal waterfalls and postcard views? Good! Gear up for tons of fun on our Jaco Jaco ATV Half Day Adventure, a 70 mile trek through Costa Rica we can't wait for you to experience. This adventure is one of our most popular tours! If you've been itching to get out and hit some trails that you've only dared dream about, we have a Jaco ATV Full Day Adventure tour that'll scratch that itch for you! Our day-long 70 mile journey begins bright and early, and takes us south of Jaco. Prepare to get dirty and have some fun! Looking for a unique adventure in Costa Rica? Bring your family and friends and come explore Jaco in one of our off road buggies!! Drive your own 4x4 buggy through quaint towns, unreal waterfalls, Jaco beaches, and postcard viewpoints; 70 miles and four hours of wet and wild off road fun awaits you on our Jaco Buggy Tour Half Day adventure. Jaco Buggy Tour Half Day Adventure deposit is $20.00 per Buggy For 2 Pax, $25.00 per Buggy For 3 Pax and $30.00 per Buggy For 4 Pax. Get ready to spend the day hitting some trails that you’ve only dared dream about! Our Jaco Buggy Tour Full Day Adventure will make your head spin with all there is to see and do. This extreme 120 km 4x4 buggy journey begins bright and early, and takes us south of Jaco. 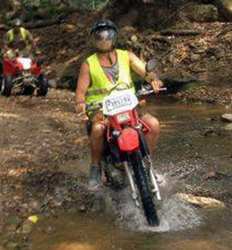 Prepare to get wet, dirty and have a ton of off road fun! Jaco Buggy Tour Full Day Adventure deposit is $25.00 per Buggy. Our Moto Express tour in Jaco is the quick blast of off-road fun and adventure you've been craving! We'll begin our 2 wheeled, 2 hour journey in central Jaco, moving toward the green forest that lines the coast. 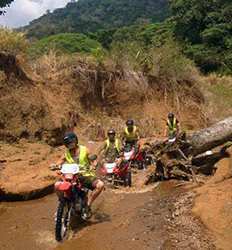 Here at The Real Deal Tours we offer discount tours in Costa Rica, and the Moto Express motorbike tour is no exception. Who says Baja is the best place to ride a motorbike? Have you ever ridden a dirt bike in Costa Rica? Four hours of rugged motorbike trails, unreal waterfalls and postcard views are yours on our Half Day Motorcyle Tour in Jaco. If you are looking for a unique off-road adventure in Costa Rica, our Motorcycle Tour has you covered. Half Day Jaco Motorbike Tour deposit is $11.00 per person.